Residents bike through the streets of Bogotá, Colombia. Photo by Dario Hidalgo. 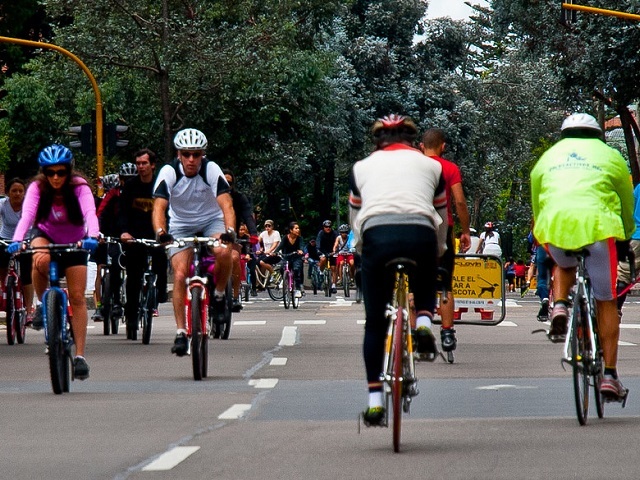 As part of Bogotá’s 16th annual car-free day on February 4, 2016 the city reaffirmed its commitment to safe cycling by converting one of the four lanes on Carrera 11—a major road—into a two-way bike lane. The road has included a bike lane since 2000, but it was located on the sidewalk and interfered with pedestrian traffic. With the 113km bus rapid transit (BRT) System TransMIlenio, 450km network of bike lanes, and hundreds of sidewalks, parks and public spaces redesigned and developed over the last 18 years, Bogotá has a recognized history as a place for innovative sustainable mobility. Still, the city is facing severe congestion, poor air quality, a large number of traffic fatalities, and low satisfaction with public transport. Moving the bike lane to the street sends a strong message about the priority of pedestrians and cyclists. Re-elected on January 1, 2016, Mayor Enrique Peñalosa has pledged to double the number of cyclists and upgrade the public transport system to make it “the best in the developing world”. The question is—is this the start of a new trend for Bogotá? Carrera 11 has long been a “hot spot” in the public debate on mobility. The road was planned as a promenade around the 1940s for a rapidly growing area of large single-family homes and embassies. However, as in many areas of the city, there has been a gradual transformation over time from housing to mixed-use. Single family homes have been replaced by high-end retail, apartments and office buildings as land values increased. The area continued to transform over the last part of the century: the most upscale malls replaced schools and homes and a whole area west of Carrera 11 became an entertainment district and was pedestrianized; many office buildings and new hotels line now the four lane promenade. The New Bike Lane on Bogota’s Carrera 11. Photo by Dario Hidalgo/Flickr. From 1999 to 2000, during his first term, Enrique Peñalosa expanded sidewalks and built bike lines. At the time, cycling accounted for less than 1 percent of total trips in the city, and bike lanes were a novelty. Despite this, they continued to grow, and a 300km network which was completed by 2001. Some residents protested that the city was eliminating parking and saw pedestrian and bike infrastructure as wasteful. Conflicts between cyclists and pedestrians became common, but were never serious. Fast forward to 2015, when Mayor Gustavo Petro introduced a change to Carrera 11, dedicating two lanes to northbound traffic and two lanes to southbound traffic. The intention was to improve connectivity to adjacent parts of the city and provide extra capacity to help support other roads. Carrera 11 and the connecting roads were modified to feature priority lanes for buses, relieving congestion for the entire area. But the change was not well received, as the east lanes looked empty while the west lanes appeared overcrowded. A little 2km stretch became subject of political controversy and city council debates. During the electoral campaign, candidates were often asked what they would do with Carrera 11. Candidate Peñalosa indicated that he would review the issue, but did not commit to maintaining or eliminating the two-way scheme. In mid-January 2016, Secretary of Mobility Juan Pablo Bocarejo announced that Carrera 11 was going back to its former self—but with a catch. The road would once again be one-way from north to south, but one of the lanes would be designated as a bike lane. A visual representation of how Carrera 11 went from 4 lanes dedicated to cars (above) to 3 (below). 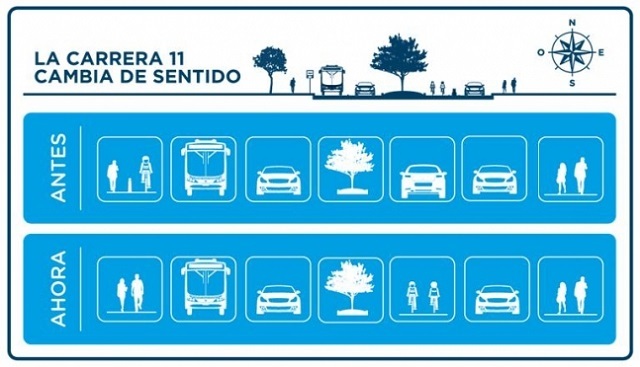 Graphic by Bogota’s Department of Mobility. This was not just a change of direction, but a change of message. The space dedicated to cars and buses was reduced by 25 percent, sidewalks expanded by 2.5m, the bike lane grew from 2.5m to 3.4m, and the entire infrastructure was redesigned for a smoother ride. The Carrera 11 intervention was an excellent example of tactical urbanism, as only paint and temporary plastic barriers were used to make it. 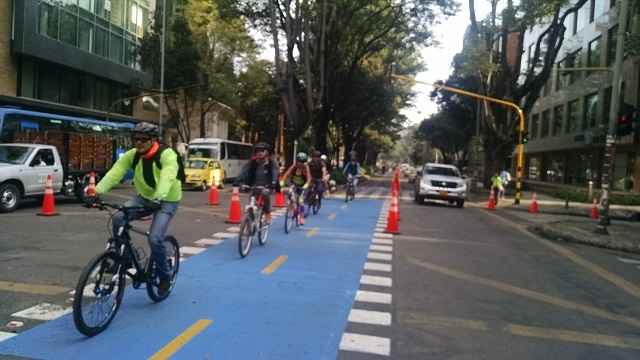 The new bike lane came as a celebration of Bogota’s 16th annual car-free day last week, which was originally approved by voters through a public referendum in October 2000. Bike activists brought a birthday cake and distributed it to pedestrians and cyclists gathering nearby. Children from the “Bike to School” (“Al Colegio en Bici”) program showed up and TV stations covered the ceremony. This short video shows a glimpse of the new bike lane in operation. So what is the lesson? Taking space away from cars, even in a city where only 10 percent of trips are made by car, is not easy. Taking space away from cars in the wealthiest district of the city, and on a controversial street, is even more difficult. While many people expected the street to return to one-way, the Mayor and his team completely change the street’s profile, improving walking and cycling infrastructure as well as public transport. Is this a sign of progress? Hopefully, but only time will tell if this will be the case for more roads in the city. After all, Carrera 11’s nice new bike lane connects to others that are in much worse condition—on top of sidewalks and running into pedestrian traffic. This new phase in the history of Carrera 11 is an important step forward, but much more will need to be done to meet Mayor Peñalosa’s target to double bike use in the city.